The United Nations Conference on Trade and Development came out with a "Report on UNCTAD assistance to the Palestinian people: Developments in the economy of the Occupied Palestinian Territory." A shocking indicator of the grim situation in Gaza is the rising infant mortality rate, one of the best indicators for the health of a community. Infant mortality has risen for the first time in 50 years. The rate of neonatal mortality has also risen significantly, from 12 per 1,000 live births in 2008 to 20.3 in 2013. 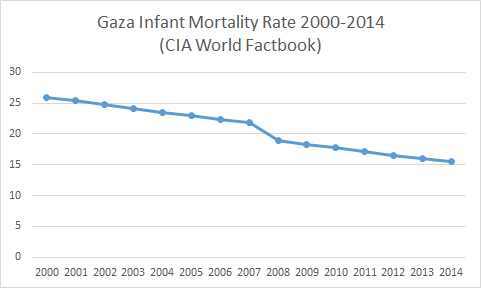 According to the United Nations Relief and Works Agency for Palestine Refugees in the Near East (2015), progress in combating infant mortality does not usually reverse. The trend in Gaza is unprecedented and rarely observed outside communities affected by HIV epidemics. Not only that, but there are quite a few countries whose infant mortality rates have increased over time - it is not "unprecedented," as the UN claims. Chile's, Belgium's and Austria's went up in 2004, Bangladesh in 2009, British Virgin Islands in 2012, the United States in 2014, and quite a few more. However, in this report, the truth is somewhat more interesting than the lies. It shows that donor aid to the Palestinian authority plummeted by 30% in 2015. The amount of money thrown by the world to Palestinian kleptocrats has gone way down. The report says "The one-sided customs union, enshrined in the Paris Protocol, and obstacles to trade and productive activities effectively render the Occupied Palestinian Territory a captive market for exports from Israel. In recent years, Israel accounted for more than 70 per cent of Palestinian imports and absorbed about 85 per cent of Palestinian exports." But that is no longer true. The same document has a table that says that in 2015, only 55% of Palestinian trade was with Israel. It is still the lion's share, but "captive market" is a bit of an exaggeration. The percentage of trade with Israel has been going steadily down over twenty years. ** The designations employed, maps and the presentation of the material in this document do not imply the expression of any opinion whatsoever on the part of the United Nations Secretariat concerning the legal status of any country, territory, city or area, or of its authorities, or concerning the delineation of its frontiers or boundaries. In accordance with the relevant resolutions and decisions of the General Assembly and Security Council, references to the Occupied Palestinian Territory or territories pertain to the Gaza Strip and the West Bank, including East Jerusalem. Use of the term "Palestine" refers to the Palestine Liberation Organization, which established the Palestinian National Authority. References to the "State of Palestine" are consistent with the vision expressed in Security Council resolution 1397 (2002) and General Assembly resolution 67/19 (2012). It sounds like the UN is saying that, notwithstanding its resolutions, its use of the phrase "Occupied Palestinian Territories" does not mean they are legally occupied, and the word "Palestine" refers to an organization, not a country. Despite this footnote, the report does not refer to the "State of Palestine" once. This is interesting! It may be as the result of an episode a few years back when UN was once asked if Gaza is considered occupied, and it couldn't give a straight answer. Good news! Israel isn't #1 Satan anymore! Fatah celebrates terror. Like they do every day. The anniversary of "filthy feet"
Talmudic rituals captured on video!